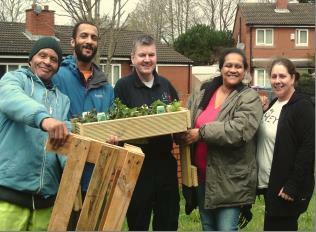 We held a community engagement event yesterday on Tagus Close as part of the Cultivating Coltart project in partnership with L8 Living Sustainably (L8LS), Granby Toxteth Development Trust (GTDT) and Liverpool Mutual Homes (LMH). There was a lovely atmosphere, as L8LS, GTDT and LMH staff alongside community volunteers started work creating raised beds out of recycled materials, such as pallets. Ivan from GTDT stated that the scheme was “very positive” and mentioned that the project will also involve installing bird boxes and flowers that will encourage a range of wildlife including insects and birds. 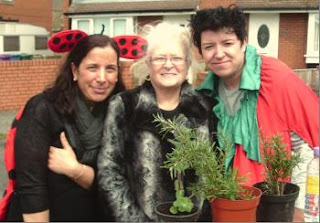 Suzanne from Tagus Close said it was a “fantastic event, encourages residents to take pride in area”, Granby Toxteth are all lovely people, great ideas”. Mr Collins of Coltart Road said “It's good to see other residents getting involved and brightening up the place” and Mrs Brown also from Coltart Road commented that we "should do more events that encourage residents to get involved and take care of there gardens, it encourages others to do the same and the whole street looks better”.